Page 18. A Plan of 1,060,166 acres of land and water, surveyed by the subscribers agreeable to directions of the Committee for the Sale of Eastern Lands, as a purchase made by Henry Jackson and Royal Flint, Esqrs. 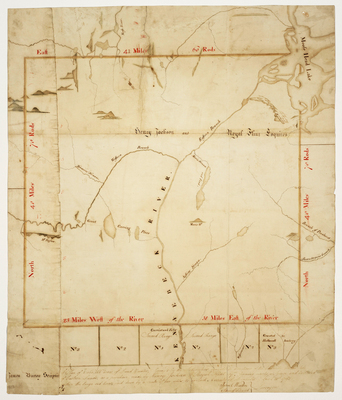 Survey of the Kennebec Million Acres purchased by Henry Jackson and Royal Flint on a scale of two miles to an inch.